If you’re an IT professional whose involved with Windows-based servers, chances are you’re familiar with more contemporary versions of Internet Information Server (IIS). It’s Microsoft’s solution for web hosting, and has been around for decades now. An open source alternative known as Apache that typically runs on Linux has been its main competitor. Although IIS is second best to Apache in market share, both products have dominated the internet in a way most people don’t realise. For IIS this is where it all began. A research project had been established with the University of Edinburgh in Scotland, located at what was known as the European Microsoft Windows NT Academic Centre (EMWAC). In 1994, a server originally running Windows NT 3.1 was hosting Microsoft’s website using software named EMWAC HTTP Server. This software had been offered both as freeware and as a professional version. Known as Purveyor and sold by Process Software Corporation, the professional version incorporated features such as user authentication, and proxy server capability. By 1995 it was a time when the internet was taken more seriously, and it was obvious Microsoft was realigning their corporate strategy behind it. Within months of Windows 95’s release, consumers had access to The Microsoft Network, Internet Explorer, and later FrontPage after the acquisition of Vermeer Technologies. EMWAC HTTP Server was primitive and began to show cracks with increasing volumes of traffic to microsoft.com. 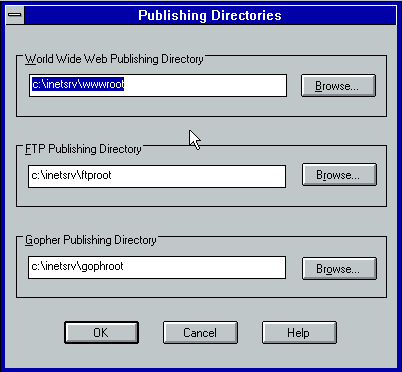 In anticipation of additional server loads with the launch of Windows 95, the web server was migrated over to a pre-release version of IIS built from the ground up. 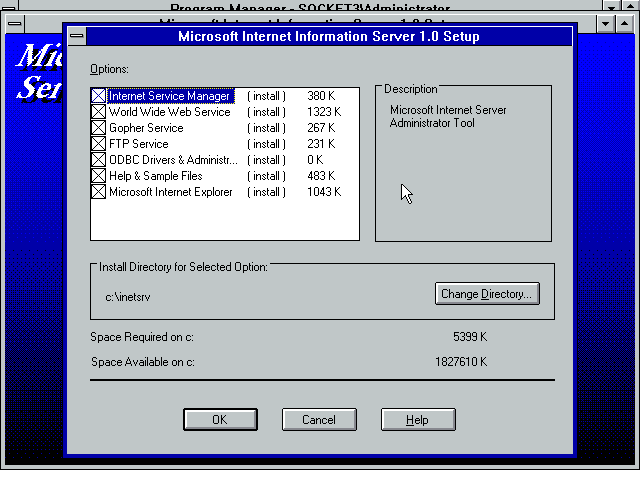 The RTM release of IIS 1.0 was distributed as part of Windows NT 3.51’s Service Pack 3 update or as a separate download. Alternatively Microsoft released copies on CD for $99 US. Installation of IIS 1.0 is via the BackOffice 2.0 Setup program, with a full installation only taking 5 MB. Internet Information Server installation options. Upon selecting the installation options, Setup prompts to confirm directory locations for each web service, for where files and web pages will be published to the outside world. This is followed by which ODBC driver to install. In this instance, only SQL Server was available as an option. With no other details required, Setup completes in next to no time and you’re given the following program group in Program Manager. Administrating web services is performed using Internet Service Manager. As below, the web, FTP, and Gopher services are all running from the same server. By default, the services are shown in Report view, though can be changed to Service or Server view if preferred and would be more useful in multi-server environments. If you hadn’t heard of Gopher, I don’t blame you. Before the widespread use of the World Wide Web (WWW, or simply what nearly everyone seems to think is just the internet), Gopher was an internet protocol developed by a group of programmers from The University of Minnesota in 1991. It was aimed to solve the issue of finding information when search engines didn’t exist, with the focus on documents that could be viewed via menus in hierarchical fashion. Visually it wasn’t much to look at but this suited the slow modems at the time. Whilst HTTP and HTTPS protocols were allocated to TCP/IP ports 80 and 443 respectively for web use, Gopher’s default port is 70. The use of Gopher declined rapidly throughout the 1990s, thanks to the WWW. Internet Service Manager showing three services running on one server. Overall there is not a great deal to look at. Apart from searching for servers, you may either start, pause, or stop a service, and view the particular service’s properties. Each of the service types have similar properties in nature to alter, divided into four tabs named Service, Directories, Logging, and Advanced. Viewing the properties concerning the web (WWW) service. Maximum number of incoming connections for the selected service on the server. The Windows NT user account to be used for anonymous connections. The form of password authentication in instances where anonymous connections are disallowed, or if the remote client requests authentication. Sets the location of files for the selected service. For example for the FTP service this could be files that you wish to be available for download, while the web service contains the HTML and graphic files needed for your web site. Choose between UNIX or MS-DOS directory formatting, altering the way a user will see the list of files and directories using FTP. Enables log files to be generated at set intervals, detailing how the service is being used. Alternatively connect to a database via ODBC to place logging data into a table. Grant or deny access by default to the service, and create exceptions based on a specific or a range of IP addresses. Limit network bandwidth across all of IIS. The other notable inclusion is Internet Explorer 1.5, only released for Windows NT. This version added support for HTML tables. In a blink of an eye, it became superseded by Version 2.0. Excuse the 16-colour VGA display, but this was the original home page hosted from IIS. Oh yes, 256-colour GIF images and Times New Roman font were the forefront of web design. The default home page hosted from the web service. Microsoft IIS 1.0 was a rather no-frills product – the lack of proxy server functionality was also seen as a major piece missing compared to other products such as Spry SafetyWeb Server. It was offered for free after all, so you can’t take that away from it.